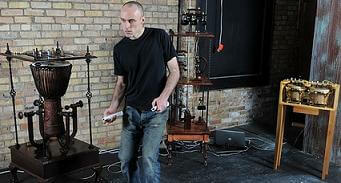 Patrick Flanagan has invented a new genre of robotic musical instrument he calls Jazari. The robust construction of the instrument as can be seen in the video employs the use of solenoids, actuators, and a couple of controllers from the Nintendo Wii. He refers to his system as Jazari Music, in which he controls a suite of djembe drums, bongos, and other percussive instruments by pressing buttons and tilting the angle of the Wiimotes. To see a more definitive appreciation of how his robotic percussive instrument works, go here. The Jazari Music robot system is driven by his own software, Factor Oracle and his research involvement with AI has helped him make his system auto responsive. This essentially means that he can jam with his instrument, on the fly, as it were, and quickly switch back to his control. Alternatively he can also loop rhythms or even have the robots improvise on their own. In case your wondering Al-Jazari was a 12th century Arabic scholar who was said to have created the first mechanical musicians.